Just four months after saying he believed a reunion tour with Van Halen was “inevitable”, Sammy Hagar now claims he’s given up on the idea because his former bandmates failed to wish him a happy birthday this year as he recently reached the milestone of 70. "People say, 'What's going on with Van Halen?' Okay, absolutely nothing," Hager told host Eddie Trunk during an appearance on SiriusXM's "Trunk Nation" (audio below). "I have no idea. I haven't heard from the guys. To me, they made a real strong statement by not wishing me a happy birthday for my seventieth, especially amongst the fact that so many people have died. I mean, a week before that Tom Petty died. Tom Petty's birthday was the next Thursday after mine, and he was still a young man, as far as I'm concerned. "With all them people dying, if somebody turns seventy, that's a monumental thing," the Red Rocker continued. “It's, like, you would think if they ever wanted to be friends, it would be so easy. And even if they didn't wanna be friends, it's just something that would be the right thing to do." 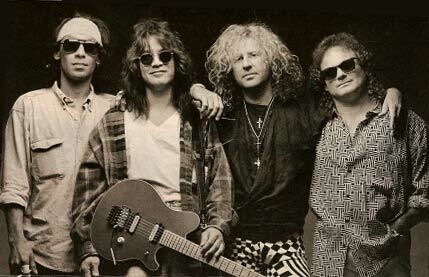 Hagar has not had any real contact with his former group since a 2004 reunion tour ended poorly, outside of a Happy Birthday tweet from Eddie Van Halen in 2016. The singer’s on-again/off-again interest in, and passive-aggressive attempts to, rejoin the group has sent mixed messages to both the band and fans ever since his original departure in 1996, but things appeared to be settled somewhat last year when Hagar delivered what is believed to be his first ever public apology to Van Halen after two decades of bashing them in media interviews. More recently, Hagar remains puzzled that his Chickenfoot bandmate – and former Van Halen bassist – Michael Anthony didn’t receive a message from the brothers when his two-week-old grandson died from heart disease earlier this year. "Even Dave [Lee Roth] sent 'I'm sorry' to Mike. And, you know, Dave's not the friendliest guy in the world, but at least he had the class to do that," said Hagar. "I don't know what's wrong with those two brothers, man. For them not to do anything for [Michael's grandson], and then again on my birthday… I didn't expect it, but then I kind of thought, 'Yeah…' I really didn't think about it. But people keep bringing it up: 'Oh, you must have heard from the brothers. Did Eddie wish you…?' No. "All that says to me is that it's over, man," he added. "Those guys do not want to be friends, and if they don't wanna be friends, then we certainly ain't gonna do a reunion. 'Cause that would mean I would just do a reunion for some money or something? I mean, I would love to do it for the fans — I really would — but other than that… nah. I'm over it, man. If they don't wanna be friends… We've gotta be friends before we can do any kind of business together. So, I don't know… To me, it's kind of put the nails in the coffin. It's kind of, 'Hmm, well, that's done. Put foreclosure on that.'" 2018 will mark the 40th anniversary of Van Halen’s groundbreaking self-titled debut album. Bassist Wolfgang Van Halen has been working on his debut solo album over the past year, although no timetable for the project’s release has been revealed to date.